Multi-Outlet Inventory in WooCommerce – How can we help? 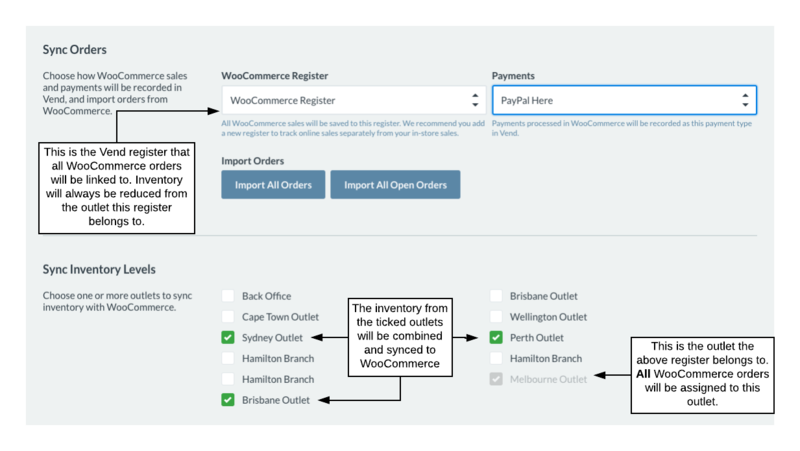 When setting up Vend with WooCommerce, you can now combine and sync inventory from multiple Vend outlets and surface this on your WooCommerce store. You can select the inventory from one or more Vend outlets and make this available online for your customers to purchase. 1. In your Vend store, navigate to Setup -> Add-ons. 2. Once you are on the Add-ons page, find WooCommerce. Select the pencil icon on the right. 3. In your Vend settings page for WooCommerce, you will see a section titled Sync Inventory Levels. 4. In this section, click the outlets whose inventory you wish to combine and sync to your WooCommerce store. Note: The outlet linked with the register you have chosen for your WooCommerce orders will always be included by default. 5. Save these settings and head over to your WooCommerce store. Your inventory from these outlets will now be combined and displayed on the relevant products in your WooCommerce store! How is this stock combined? Important: In WooCommerce, make sure you set "track inventory" to "on" for products that you are syncing with Vend. If inventory tracking on your WooCommerce products is turned off, inventory changes for these products will not be synced between WooCommerce and Vend. Vend inventory will always be reduced from the outlet whose register is linked to your WooCommerce store, even though inventory from multiple outlets is combined and surfaced on WooCommerce. When an order is made in WooCommerce, it is possible that the inventory sold could be more than the inventory available in the single outlet whose register is linked with WooCommerce. This will result in the outlet going into negative stock. To resolve this and fulfill the order you will need to perform a stock transfer to transfer stock from other outlets to the outlet you are fulfilling the order from. Because Vend will combine and sync updated inventory levels to WooCommerce after every inventory movement, as soon as you send a stock transfer, inventory will be deducted from the source outlet and updated on WooCommerce. However, it will update in Vend once the transfer have been received. It is, therefore, advisable that you receive any sent stock transfers involving WooCommerce products as quick as possible to avoid any misrepresented stock totals in your WooCommerce store.